Posted on Thu, May 3, 2012 : 10:28 a.m.
It’s asparagus season; when Michigan’s brave warriors thrust their helmeted heads through the dirt, hoping a late frost doesn’t blindside them. So my ammunition’s at-the-ready - a battery of recipes that will maximize the bounty through the middle of June. Grated daikon and ginger for dipping sauce. Fresh asparagus is available year round but, for me, asparagus from Michigan soil has a brighter, fresher taste, and a crispier texture than off-shore imports. Purchasing asparagus from local farmers when the morning dew sweats their pointy little heads is a sweet treat, indeed. According to Extension Horticulture Specialist, Douglas Sanders, Michigan ranks with California and Washington State in the top-three U.S. asparagus-producing states; most of the commercial acreage located on the west-central part of the state in Oceana County, near Lake Michigan. Look for firm, fresh, spears with closed, compact tips and uniform diameter, to ensure all spears will cook in the same amount of time. Asparagus will keep fresh for a few days. Place in a vase, as you would a bouquet of flowers, add water to cover stem ends and refrigerate. 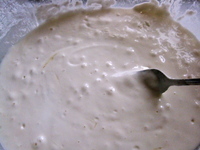 Keep tempura batter cold and don't over stir. Rakishly thin asparagus, those first to hit the market stalls, may be eaten raw or need no more than a five to ten second blanch in well-salted water. Enjoy by themselves or, perhaps, served with a Caesar and Hollandaise dipping sauce. But today I present you with a recipe for their big brothers and sisters, the thicker, meatier asparagus that can handle a batter and sizzling oil. The award-winning documentary “Asparagus! Stalking the American Life”, which New York Magazine called, “Oddly Brilliant,” is a must-see for locavores and asparagus lovers. The documentary, set in Oceana County, offers a behind-the-red-carpet glimpse of the “Miss Asparagus” Pageant and interviews with farmers about their trials to compete with factory farms and off-shore industries. This recipe would be the perfect nosh for watching the film. 1. Whisk together vinegar, soy sauce, and wasabi. 2. Stir in ginger, daikon and scallions. 2. In a large fry pan, place enough oil so it’s 1- 1 1/2-inches deep. Heat until oil sizzles in a bit of tempura batter. Coat asparagus in batter, shaking off excess batter. 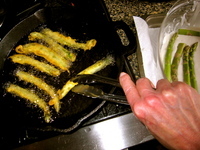 In batches not over-crowding pan, fry until asparagus is golden-brown on all sides, about 4-5 minutes, turning with tongs. Drain on paper towels and serve with dipping sauce. Fri, May 4, 2012 : 1:09 p.m.
Tempura anything = great. Anything with wasabi sauce = great. If you're doing tempura veggies also try green beans, broccoli and our favorite - yams. Tue, May 8, 2012 : 7:16 p.m.
Thu, May 3, 2012 : 6:34 p.m. 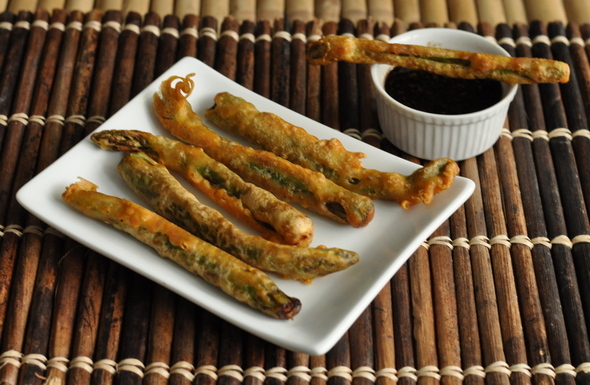 I love vegetable tempura, especially the asparagus. Thanks for the tasty recipe, Peggy! Thu, May 3, 2012 : 4:53 p.m. Though, I must say, the *wasabi* part of your equation here is a very good idea! I'm feeling like this extra-sweet and mild but balanced with earthiness local aspargus goes very nicely with some Asian spice and/or heat indeed! Tue, May 8, 2012 : 7:14 p.m. Thanks for that! I'm a big fan of wasabi in many Asian-styled vinaigrettes and marinades. Thu, May 3, 2012 : 4:50 p.m.
Tue, May 8, 2012 : 7:17 p.m.
Thu, May 3, 2012 : 4:16 p.m.
Now you aa.com food writers have even turned asparagus brown. What's with all of the brown and tan food! Tue, May 8, 2012 : 7:13 p.m.
Thu, May 3, 2012 : 3:52 p.m.
Another example of how to take a healthful food and convert it into something fried, carbo filled and unhealthy!---though, to be fair, it SOUNDS delicious! Tue, May 8, 2012 : 7:12 p.m.